Reproduction of the original standard interior steering wheel center horn trim ring for 1968-69 Mustang and various other Ford and Mercury models with 2 spoke steering wheels. This reproduction is manufactured in zinc die-cast metal and features a bright chrome finish. Each steering wheel horn ring replicates the original in appearance and fit. Will install on OEM or reproduction steering wheels. 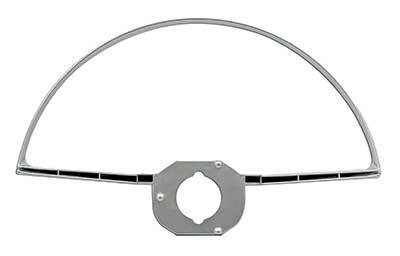 Replaces Ford part # C9AZ-13A805-B.